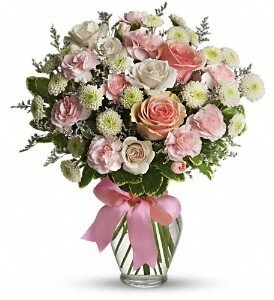 Pink Cotton Candy Floral Bouquet in Whitesboro, NY - KOWALSKI FLOWERS INC.
A beautiful combination of plants in a wicker basket. 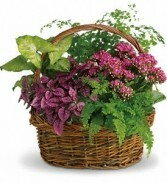 Assorted live plants are gathered together with silk flowers to add a burst of color. Plants and/or basket may vary. We hand design our gift baskets. 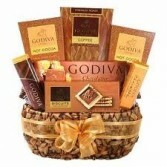 A charming container is filled with assorted delicious Godiva Chocolates. Godiva bars, nuts, cookies, pretzels & more all wrapped in cello with festive bow. Each basket is hand designed with pride. 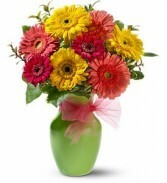 A glass colored rose vase is filled with assorted gerbera daisies with assorted fillers.